As mentioned before, I like to wander the streets of Taipei in the early hours of the morning, and the Zhong Xiao area offers a completely new experience with a gazillion times more lights and signs to see as well as a few small parks to visit. During my peaceful walks I have seen a few bizarre things which I have classified in the “only in Taiwan” category. Sun Yat-Sen is the founding father of the country or something or rather and there is a Memorial Hall dedicated to him at the edge of the shopping district. The area has a large building in the middle of a wide open space which includes a few gardens and a pond, all elegantly designed and kept in pristine condition. The building is used as a performing arts theatre and the outside area is basically a public park with people just sitting around chatting, riding their bikes or walking their dogs. To get on with the story, as I was walking through the area I see far off in the distance two figures on a bench. Upon closer inspection I can make out a male with his female companion doing the hanky panky in the middle of the Memorial Hall. Must be a new way of paying respect to a prominent historical figure. Another weird event happened right downstairs from my place in a lane with a fruit market. As I was walking down the lane I notice a couple passionately making out to the side. Trying very hard to ignore them when passing, the woman lets out two loud moans, one of them very high pitched, which got my attention and I look their way. The guy had almost taken the girl’s top off and one hand was down her pants. All this was happening in a non-secluded lane close to a brightly lit fruit market. Talk about taking public displays of affection to a whole new level. This last one really tops my chart of wtf’ness. The cops here are really big in to the whole random testing thing at night and pull over scooters or cars to perform alcohol tests or vehicle and license compliance inspections. On this particular night two cops were doing their thing outside Sogo and were directing scooters to the side of the road with the normal red traffic glow light tube thing. A cop was waving down a scooter which was slowing down, completely typical behaviour. Then all of a sudden the cop runs towards the scooter and smashes his traffic stick on the rider sending broken plastic flying. The scooter picks up speed and hoons off into the distance. This all happened so fast that I pretty much stopped walking and just stood there trying to figure out wtf happened. I guess I’ll never know. Please do not leave rubbish and banana skins lying around. huh?! 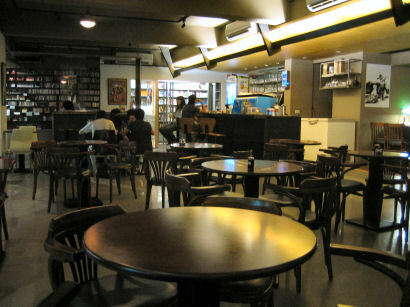 A cafe next to Tai-Power Building. One of my favourites. 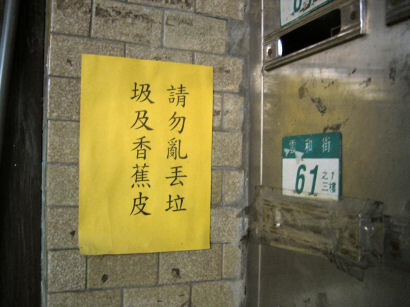 wow, people in zhong xiao are completely different from those in my area…which was like um, two streets away. I used to see couples really late at night (or early in the morning) doing their first kiss or whatever in the dark and they were so freaking shy!! They’d stop be all embarrassed when I walked by. I guess there were more uptight, frigid folk living in my street. I was very impressed by this post. Hope to see more stuff. You can buy Dell in Taiwan?